A 19th century wreck discovered 40 miles off the coast of North Carolina has been conclusively shown to be the steamship Pulaski which sank in a massive explosion in 1838 and claimed the lives of some the southeast’s most prominent individuals and families. Divers with Blue Water Ventures International found the wreck in January under 100 feet of water. 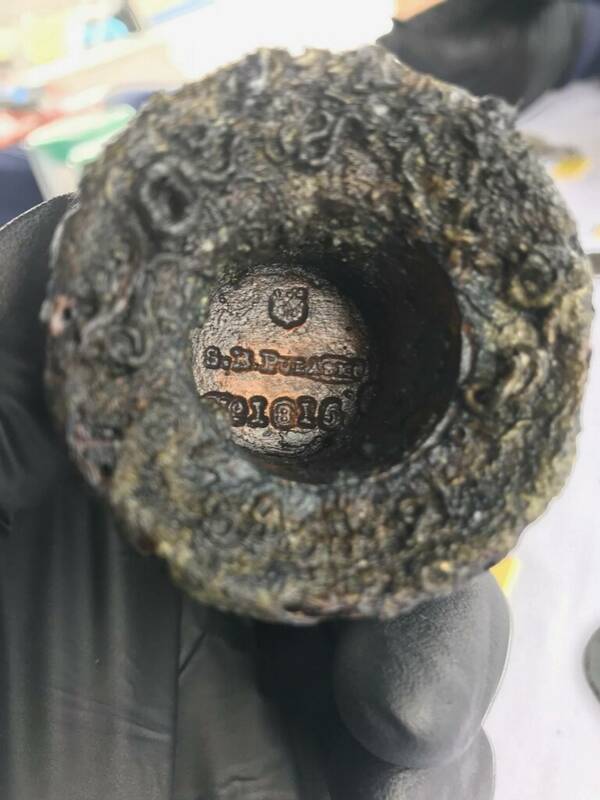 The locations, silver coins dating up to the year of the wreck and no later, plus evidence on the wreckage of a boiler explosion on the starboard side suggested it was the Pulaski, but there was no, pardon the term, smoking gun. To determine the ship’s identity with certainty, they needed to find an artifact with its name on it, like the bell or a labelled part of the boiler. This week the smoking gun was found in the form of a candlestick holder and a token, both stamped “SB Pulaski” (SB stands for steamboat). Dr. Joseph Schwarzer, director of the North Carolina Maritime Museums, was among the historians waiting for Webb to prove he was in the right spot. Schwarzer was hoping for the ship’s bell, but he says a candlestick holder with the ship’s name is just as good. The Pulaski sailed from Savannah, Georgia, on June 13th, 1838, and picked up more passengers that afternoon in Charleston. It departed the next morning for its ultimate destination in Baltimore. An easterly wind picked up in the afternoon. The choppy sea forced the boat to ramp up to full steam pressure to make any progress. According to the testimony of wreck survivors documented in the 1840 book Steamboat Disasters and Railroad Accidents in the United States by Southworth Holland, disaster struck at 11:00 PM when the starboard boiler exploded. It blew up the promenade deck above it, the starboard side of the ship, the bulkhead between the boilers, the forward cabin and the bar room. The ship first listed on its relatively undamaged side, but it soon rolled onto the starboard side and water flooded into the holes. The women and children had been hustled to the promenade deck above the ladies’ cabin, and men joined them when the aft deck flooded. Soon the waters rose to the promenade deck and the ship broke in two. The stern rose briefly, then split into three, throwing everyone on the deck into the churning waters. The four lifeboats were launched immediately after the boiler explosion. One fell apart as soon as it hit water. The others took on as many survivors as they could (ie, hardly any) and at various times attempted landfall in crashing surf and high winds. Two of the lifeboats overturned and several passengers drowned. Others were able to make it to shore. 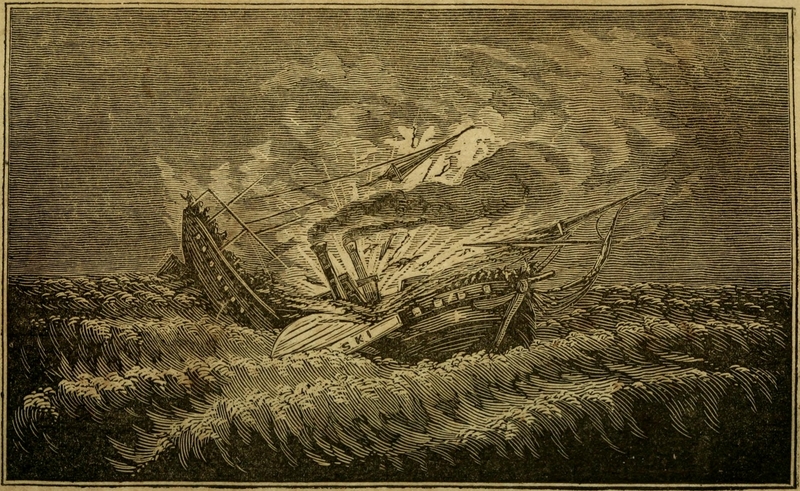 Twenty-three passengers manage to survive on the fore of the ship which floated instead of sinking, and Second Captain (first mate) Pearson clung to a plank overnight until he managed to navigate his way to the remnant of the Pulaski. They were still clinging to the fore, now lashed together into a makeshift raft, baked by the sun, desperately thirsty, on Saturday when another piece of flotsam bearing four more survivors came into view. The four joined the larger group on the raft. Together they lived through a gale on Sunday, saw four ships on Monday who were too far away to see them and finally, blistered, parched and sleep deprived from having to keep the underwater raft afloat, they were rescued on Tuesday by the schooner Henry Camerdon. The schooner picked up another four people who had been spotted floating in the distance, barely alive, on a raft of planks from the promenade deck. The last eight people to be rescued managed to make it to land on the New River Inlet on Wednesday. They were nearly dead from dehydration and exposure. In total, more than 100 passengers died in the Pulaski disaster. Maritime archaeologists are still studying the site, ensuring it is explored with the utmost care to ensure the context is preserved. They want to find scientific evidence of what caused the explosion, as so far historians have had to rely on survivor accounts which is less than fully reliable. This entry was posted on Thursday, May 10th, 2018 at 9:11 PM	and is filed under Modern(ish). You can follow any responses to this entry through the RSS 2.0 feed. You can skip to the end and leave a response. Pinging is currently not allowed. When it was discovered the boiler was dry, seawater was introduced too quickly and it exploded… blew the top right off it. In case your wondering how I know this..I was the first diver on it since the day it went down, and currently am part of the recovery group.